1. What is the very first thing you remember making as a kid that you were really proud of? In Grade 3, my friend and I made this picture of a butterfly and a flower out of tissue paper. It was outlined in pencil a big sheet of stiff paper (she probably drew it; I wasn't that great at drawing). We then "coloured it in" with little squares of tissue paper that we moulded on the end of pencil and glue onto the paper. The tissue paper stood up and the final look could be likened to a high-pile hand-hooked rug. It was in the end probably a couple hundred pieces of tissue paper. We got to stay in during a few recesses to finish it, because our teacher knew it was going to be an impressive piece! I made a fairly traditional looking quilt with a gridded layout, sashing and borders. It was a block that I designed that depicted a crane, but one of the 12 cranes flew the opposite way to all the others. I had no idea what I was doing and I only visited one quilt shop and a chain store to gather my supplies. I hadn't a clue about the modern quilting movement. The back was sort of improvised with the leftover fabric and more "modern." 3. Are you self taught? 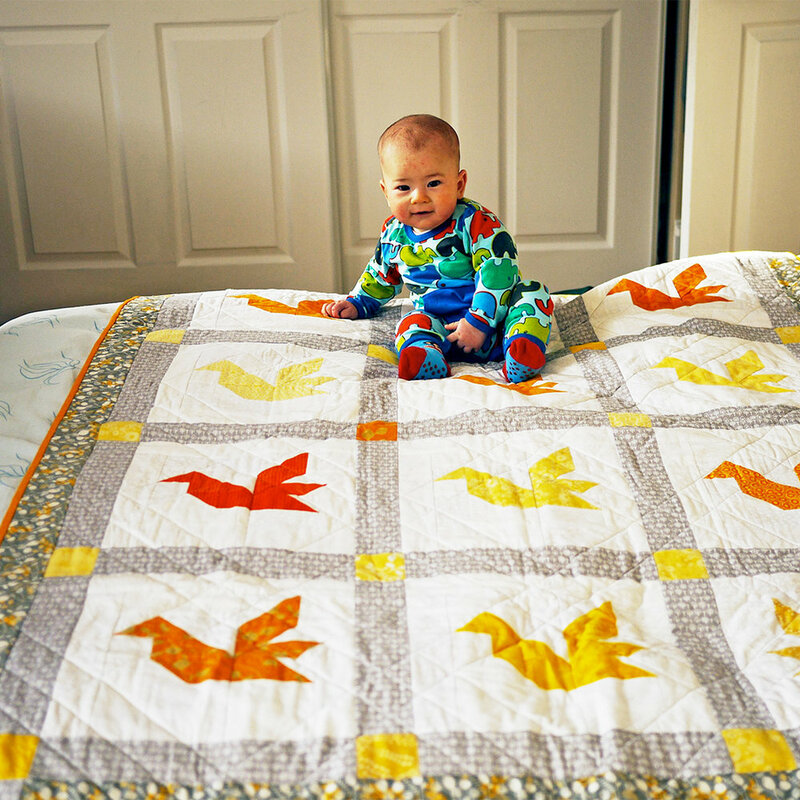 For starting quilting in 2011 your work is very impressive, what has your quilting journey been like? I am a self-taught quilter, but I have had extensive training and experience in the design fields. I think that this background has given me a relatively fearless approach to quilting. Anything can be made, it's a matter of whether it's worth making and how it should be made. It's been two years since I started quilting seriously and I have learned so much in that time. There is a glut of information online to learn from, which is wonderful. I've learned so much from my guild mates, as well. The trickier part is determining what should be taken into my practice and what information or techniques are not for me. Surrounding myself with community has been integral in pushing me forward; an encouraging word goes a long way and it's very motivating. I certainly would not have pursued quilting with such gusto had there not been people to back me. My journey has been entwined with people, both quilters and non, and that makes it worthwhile and enriching. 4. When did you start making patterns? Do you do wholesale? I started designing patterns in early 2017, a year after I joined the MMQG. There were some people that had asked for patterns for the Gemology Collection I had launched and I thought this would be a way to add a different revenue stream to my work. The first patterns I designed were a set of four gemstones. Funny enough, the day after I release the last of the series, Princess Cut, Kat Jones' Bling won Best in Show at Quilt Con. 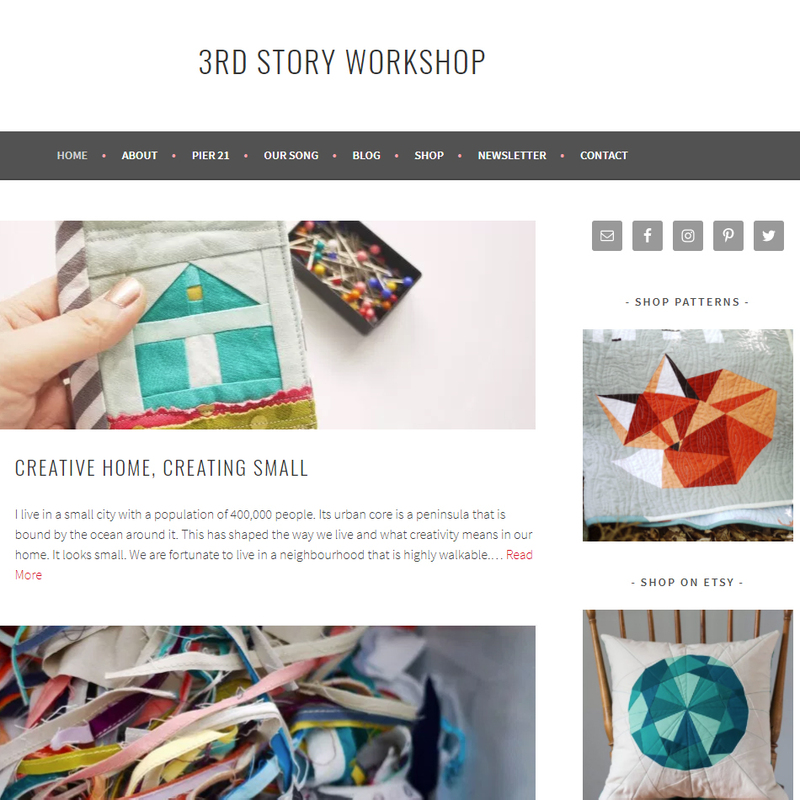 I have since released three more paper-pieced patterns, which were spurred from commissioned works and wonderful clients. 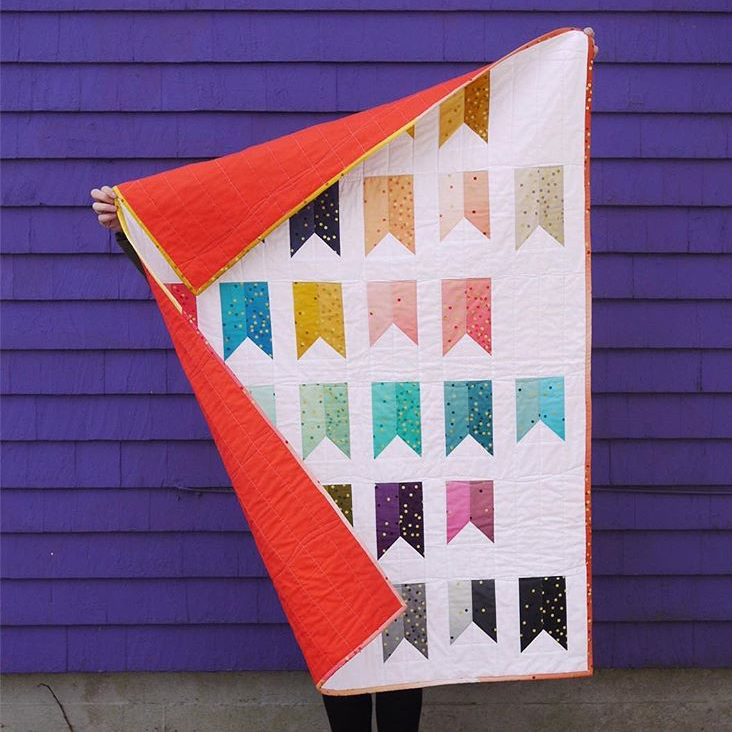 Later this month, I will release my first traditionally pieced pattern, Banner Year. I am doing wholesale right now, mostly to shops in Canada. 5. What's next for you? Any exciting projects you can tell us about? Currently, I am working on an exciting collaboration with award-winning singer-songwriter Meaghan Smith. I have gotten so much out of the local, Canadian and international community of quilters that I wanted to honour these people in a special way. Quilters are special people with such generous spirits, both with their work and their encouragement of each other. Meaghan, whose mother is an avid quilter, is writing a song about the quilting community and I am designing a quilt pattern to accompany the song. It will being crowdfunded through an IndieGoGo campaign. The project will be launched in late spring and to keep tabs on it, you can sign up for my newsletter HERE. 6. What would you recommend for our playlists. Songs or podcasts. 1) My favourite podcast is 99% Invisible. I think everyone should listen to it so they can understand how design influences every aspect of their lives. I have often said that design is only noticeable when it is extremely good or extremely bad. The vision for my professional life is that people will understand design and how it makes the world better, not prettier. 2) Wow in the World is an entertaining science podcast for kids with loveable characters Mindy and Guy Raz. 3) Since I am working with Meaghan Smith, I listen to a lot of her music. Well, to be honest, I listened to a lot of her music before I started working with her! Her current songs are all commissioned works through her "Our Song" project. They are very meaningful songs that honour, commemorate, and celebrate real people and relationships. Get your Kleenex out.